Lots of good stuff by Caroline’s Miscellany of late, rather than list them all, suggest go straight to her blog. And congratulations to House Historian whose first book will be published in the spring. I love the idea of doing the pilgrimage walk to Compostella and one day I’d like to chuck a large seashell around my neck and give it a go. The problem is, it takes time. But fortunately, we have a pilgrim route on our doorstep: London to Canterbury. This should probably take three to four days, I reckon. A quick tweet produced an immediate small flurry of interest in such a project. But Twitter is not a good forum for this sort of thing. So let’s take things one step further for the moment. If the idea appeals to you in principle, please send an email to admin@londonhistorians.org with “pilgrim” in the Subject line. This denotes interest only, not a commitment in any way, shape or form. I, meantime, will start on feasibility: route, cost, time, accommodation, that sort of thing. 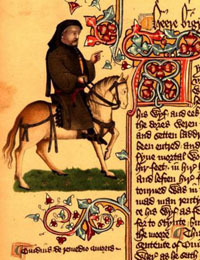 For a start, I understand the original route is blighted by M roads and A roads, so we’ll have to check out alternative scenic options while staying as close as possible to Chaucer’s journey. I think the trip should be done no earlier than mid-July and no later than end of September and probably start on a Saturday going through to a Monday/Tuesday; straddling a weekend, at any event. A quick slap-dash post while this is newsy, and perhaps matching the sloppiness of media reporting yesterday about 55 Broadway receiving Grade I listed status. Most of the reports I saw or heard touted it at the time of opening(1929), as being “London’s tallest building” when what they meant to say was London’s tallest office block, St. Pauls remaining London’s tallest for some time to come. The word “skyscraper” was much bandied, ironically I hope. No matter, I was quite surprised that it wasn’t Grade I already. 55 Broadway is the headquarters of London Transport and sits atop St James’s Park underground station. It was built between 1927 and 1929 and designed by the legendary modernist architect Charles Holden (nb: great link). A few years later, Holden extended the record for London’s tallest office block when he designed another iconic building: University of London’s Senate House. But probably Holden is better known for many of London’s art deco style tube stations, particularly in the suburbs. He also designed the wholly subterranean Piccadilly Circus station with its circular concourse. All of this wonderful work was the result of his close collaboration with Frank Pick, the visionary managing director of the then Underground Group. The best part of a century later, we tend to take these wonderful public buildings for granted. Coincidentally, and as luck would have it, the V&A (in conjunction with RIBA) currently have an exhibition of Charles Holden’s preparatory sketches for his underground designs. More details here. (scroll down a bit). The show ends on 13 February, don’t miss it. He delivered these papers to John, at his chambers, and was asked by him to join their party the same evening to Astley’s. They were going to take the two eldest boys to Astley’s. from Emma, by Jane Austen, Chapter 54. Long-faded in popular memory, “Astley’s” in its day occupied a huge space in the public imagination, among Londoners in particular. Combining for the first time the then-disparate entertainments of trick-riding, acrobatics, clowns and pantomime, it was the world’s first modern circus. Mentioned in the popular fiction of Dickens, Austen and Thackeray among others, it was oft-lampooned in the pages of Punch. 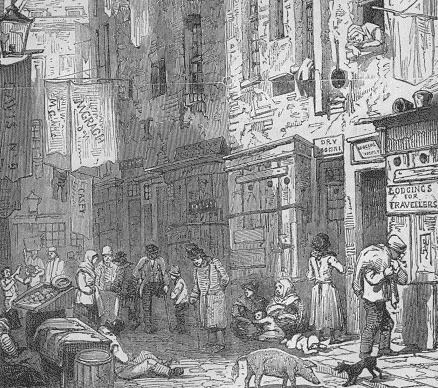 But Dickens himself loved the place. 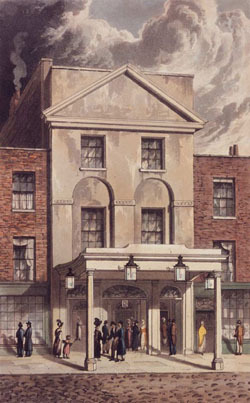 It was based just south of Westminster Bridge in part of the site of today’s St Thomas’ Hospital. Astley’s Amphitheatre, as it was most commonly known, existed under various names and proprietors from the 1770s until 1893, nearly 80 years after the death of its founder, the remarkable Philip Astley (1742 – 1814). Philip Astley was an amazing character. The son of a cabinet maker from Newcastle under Lyme, he became a master of horsemanship and swordcraft in the 15th Light Dragoons, rising through the ranks to sergeant-major. He saw plenty of action during the Seven Years War, distinguishing himself by capturing an enemy standard. But his métier was horsemanship and he completed his service breaking and training horses. Such was his esteem, on discharge in 1766 he was given a white charger called Gibraltar by General Elliot. Six feet tall with a hot temper and a booming voice, Astley was a man who stood out in a crowd. But for all his bluff outward appearances, Astley was a shrewd operator and businessman: he did his homework, what we would call market research. Visiting London’s leading theatres, he noticed that audiences loved the supplementary entertainments: jugglers, clowns, acrobats. At the same time, dramatic theatre in the age of David Garrick (1717 – 79) was taking itself more seriously, and these novelty acts were increasingly being dropped from the bill. Astley identified an opportunity to make these acts the focus of the entertainment combined with highly popular equestrian troupe performances which typically took place in parks or fields outside the city centre. Setting up shop with an open air stage on land south of Westminster Bridge, he met with immediate and resounding success. 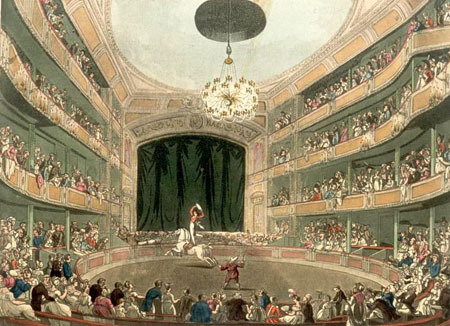 Rather than stop there, the energetic impressario almost immediately opened a similar show in Paris (the Manège Anglais, later the Amphithéâtre Anglais which was thereafter mostly run by his son John, also a highly-talented equestrian) and soon afterwards, in Dublin. And when the London season finished in the spring, he took his company on tour around Britain. But Astley’s progress was not all plain sailing. Competition soon sprang up in the form of the “Royal Circus”, established by his protegé and now rival, Charles Hughes. Although successful for a while, Hughes and his partners lacked Astley’s business acumen and their operation struggled for years mired in debt and constant feuding, eventually disappearing altogether at the turn of the century. 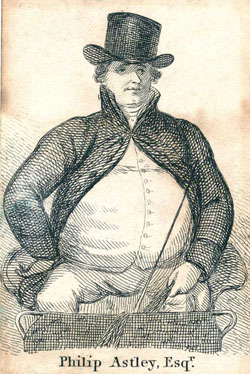 Astley’s second problem was the loss of his Paris operation after the revolution, something he bore patiently until it was restored after the Peace of Amiens in 1802. And third, the scourge of all theatres in an age of wood, canvas, spirits and flame-based illumination: fire. Astley’s Amphitheatre burned down in 1794 while Astley was away on active service with his old regiment (aged 51, what a trouper! ), and again in 1803. Fortunately, his business had more than enough bottom to allow immediate rebuilds. War and revolution notwithstanding, Astley spent much time in Paris, where he and the locals clearly appreciated one another. He died there in 1814 from stomach gout and was buried in the Père Lachaise cemetery. Son John continued the business until his own death from alcohol-related problems seven years later. Thereafter, Astley’s continued more or less successfully and popularly though almost the entire 19C under various managers and owners, notably Andrew Ducrow, Dion Boucicault, the Sanger brothers and William Batty. The building was demolished in 1893. Hercules Road in Lambeth, where Astley had his mansion, is named after one of his popular acts, the human pyramid, or Force d’Hercule. In his time, he was celebrated in song and fêted by kings, queens, princes and people alike. Today, unlike the likes of PT Barnum and Billy Smart, this titan of popular entertainment is all but forgotten. One can only wonder what the Millennium Dome project would have become with Philip Astley in charge. 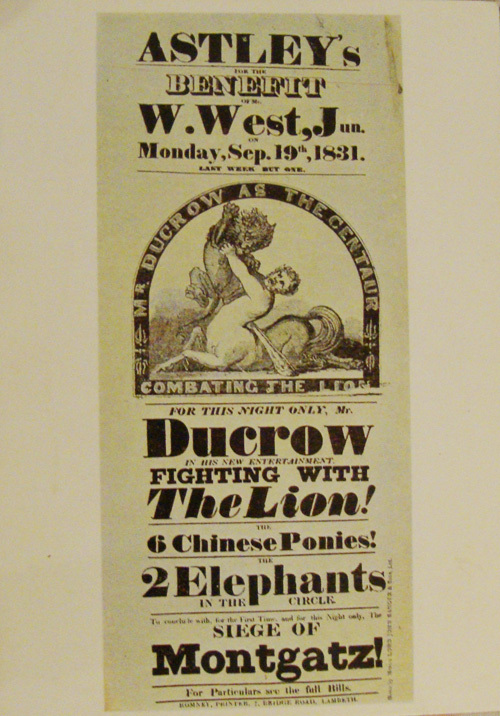 On our recent visit to Kensal Green Cemetery, one of the guides showed us this advertisement for circus performer Andrew Ducrow, whose tomb is in the cemetery. It shows Astley’s still going strong nearly 20 years after the death of its eponymous founding proprietor. Of the sources listed below, the best is Circopedia, while AVictorian.com (a delightful discovery today) gives interesting contemporary reports. Brewer’s London Dictionary of Phrase and Fable by Russ Willey. If you live in the greater London area, please check our list of local history societies here, and do let us know if we’ve missed yours out. 1) They are value for money. Typically they cost £5 – £12 per annum. I’d like to address the possibly delicate question of 4). At most of these meetings, I am invariably among the youngest there, and being in my early 50s, I’m no spring chicken. Through Twitter, Facebook and other agencies, I know that London is packed with history lovers of all ages, yet there seems to be little Venn diagram crossover between these groups and local societies. Where does this leave local groups? When their members pass on, will they wither and die? I don’t think so: most of these organisations have been around for over 50 years and all appear to be thriving. I believe that when people reach a certain age – say 55-65 – they tend to start doing things such as gardening, playing bridge… and joining their local history society. I’m aware that I’m generalising a bit here, but I believe this is the demographic that nourishes the local groups from the bottom end. So if you’re under 50 and reading this, do yourself a favour: check out your local history society, you may be missing out. Oh, and by the way, membership of a local history group gets you a £10 discount off membership to London Historians, please contact us to find out how. Estimated 34 million pedestrians a year pass through. Early 17C Robert Baker wealthy draper/tailor, maker of piccadils (fancy collars) buys land north of east part of modern Piccadilly (near corner of Great Windmill Street) and builds large factory-mansion called Piccadilly Hall. Late 17C, area around PC gets built up with shops mainly and becomes overtly commercial. Wealthy and aristos start building town houses north of Piccadilly into what becomes Mayfair. 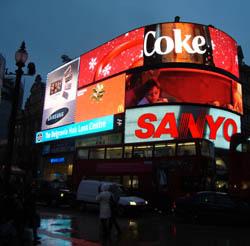 Despite being named Portugal St after Charles II’s consort Catherine of Braganza, people continue to call the street Piccadilly. 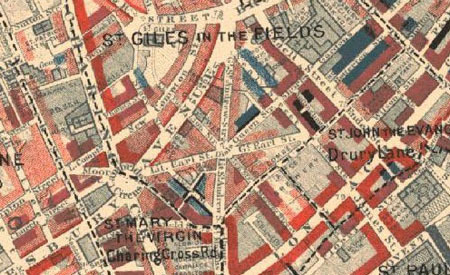 1886: Shaftsbury Avenue and Charing Cross Roads developed – Joseph Bazalgette heavily involved. 1893: Shaftsbury Memorial Fountain unveiled by Duke of Westminster, designed by Alfred Gilbert. 1925-28: Piccadilly Underground Station rebuilt, at junction of Piccadilly Line and Bakerloo line. The first entirely subterranean tube station. 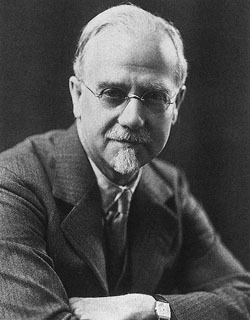 Architects: Charles Holden and SA Heaps. 2) The London Encylopaedia by Weinreb, Hibbert et al.